We offer a bespoke cupcake service, where we can design your cupcakes to match a theme. We can make your cupcakes to compliment your cake, or a specific party theme. For wedding cupcakes, please have a look at our Weddings page. Cupcakes start from around £8 for 6/£15 for 12 for a vanilla cupcake with buttercream icing and a small fondant decoration. We also offer a cupcake tower. 24 cupcakes with a 6" top cake, starting at £50. Our Giant Cupcakes come in two sizes. 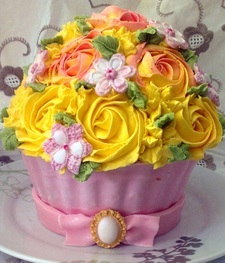 The Giant Cupcake serves 20 to 25 people, the Jumbo Giant Cupcake serves 40 to 50 people. For a list of flavours and fillings/toppings, please look here. Vegan and gluten free options are also available. We require at least two weeks notice for cupcakes. Cupcake towers with a top cake require three weeks notice, along with a deposit of half the cost of the tower and a refundable £25 for the hire of the cake stand. 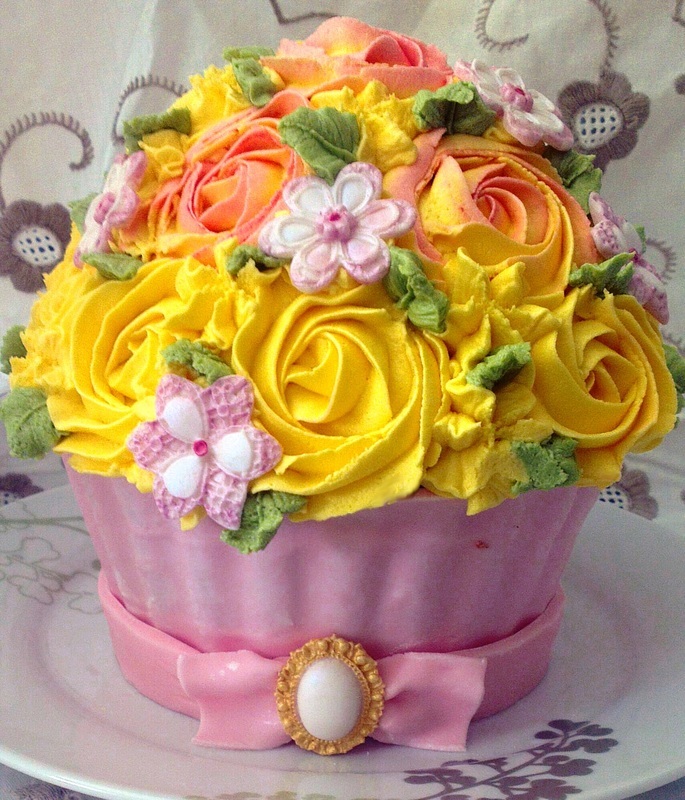 This giant cupcake typically comes with a fondant covered bottom and buttercream covered top with some optional fondant decorations in your choice of colours. Layers of your favourite cake flavour and choice of buttercream filling. Typically serves 20-25. Prices start at £30 for vanilla sponge with vanilla or strawberry flavoured buttercream filling. Vanilla sponge cupcakes with animal print fondant. Vanilla sponge cupcakes with a vanilla flavoured buttercream. Neopolitan - A layer of vanilla sponge, a layer of chocolate sponge, and a strawberry flavoured buttercream topping. A mixture of chocolate sponge cupcakes with chocolate buttercream, and vanilla cupcakes with vanilla flavoured buttercream. Lemon sponge cupcakes with a lemon buttercream.